"﻿﻿Orange ﻿﻿Is the New Evil"
Thanks to everyone for coming out and supporting our Fair Oaks swimmers tonight. As always we were the most spirited team there and . . . (drum roll please) took home the team GOLD! It was a great team effort. Special thanks to our leader who has kept us organized, coached us to victory and put on a fantastic swimming performance -- Karen Williams, Adam -- for sacrificing childhood memories (and cleaning out his closet) to allow for a proper awards ceremony, and Casey, who sacrificed her body so we could take a second in the all important T-shirt relay. In addition to posting in all categories, we won the Free Relay and took second in the Medley relay. Thanks Team Mates. Go FO. Way to go FOCA ……. Fair Oaks brought home the GOLD MEDAL in the swimming event tonight. 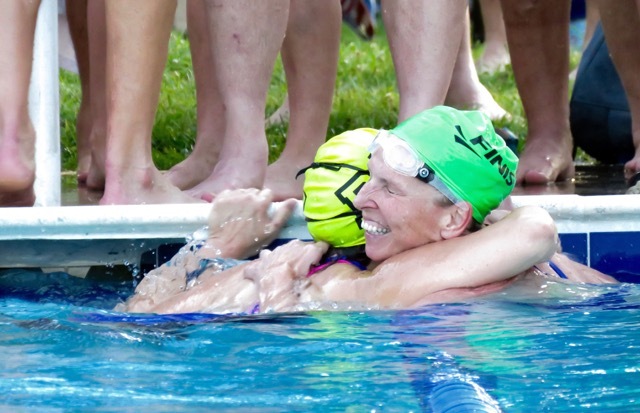 Strong performances all around and a special thank you to coaches KAREN WILLIAMS (first place women's over 50 free) and MARK MARTIN (first place men's over 50 free). Dr. Evil would have been proud (inside joke for those in attendance at Whitehurst tonight).